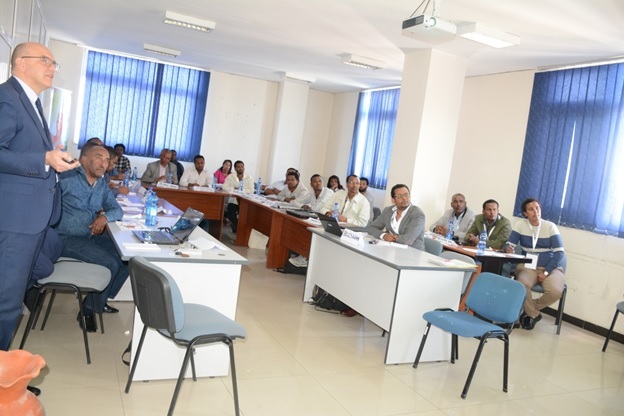 The Ethiopian Horticulture Producer Exporters Association (EHPEA) and Italian Trade Agency (ITA) jointly offered training in Addis to representatives of various horticultural companies. The training, offered at EHPEA’s Meeting Hall, was aimed at developing the companies sales and marketing skills to enable them approach international market actively. Building upon the cooperation that started three years ago on the occasion of exhibition, ITA has set aside a corner for the Association to take part in the internationally renowned Macfrut Exhibition due to be staged in Italy from 8 – 10 May 2019. The Italian Development Cooperation Agency (IDCA) has so far sponsored companies from Ethiopia to participate in the event. ITA Trade Commissioner Simona Autuori said Italian businessmen have invested about 15 million Euros in Ethiopia’s horticulture sector. The investors have been providing support towards boosting productivity of those engaged in the sector. Over the last couple of years, the state of political instability in the country somehow affected the involvement of Italian investors in Ethiopia because investors often opt for stable investment climate. Apart from this, they have been providing support to Ethiopian traders of coffee and horticulture in finding clients. The training, concluded this week, was backed by a farm visit.